honigdesign: Garden Party Dress Pattern - FREE! Garden Party Dress Pattern - FREE! Fancy a sewing project this week-end? How about your very own Garden Party Dress?! I'm so excited to finally be able to post this pattern! (Remember versions, 1, 2 and 3?) It's been a super fun project, the only glitch - my printer breaking down at the last minute - but what's life without a little drama? I hope you all like it as much as I do. Customising the sleeves. The GPD has a very fitted bodice designed with little ease, especially in the sleeves. You may find these too narrow - it's a good idea to measure the sleeves and adjust them before you cut. Moving the skirt band. This tutorial shows you how to adjust the location of the skirt band, especially important if you plan to use lace! It's a simple and modern dress, but with a bit of vintage about the silhouette. It's an all-in-one outfit. No cardigan or shawl needed. It's versatile and multi season. You can wear it with heels, boots or sandals for a complete look, either casual or dressy. Sew in a warm wool for cooler days or lightweight cotton with short sleeves for summer. It has SIX style options, on the skirt, bodice and sleeves. That's why I love it, but why not see for yourself? I'd be endlessly grateful, if you do sew it, if you could send me a little feedback to designhonig[at]gmail[dot]com. I've also tried to make the .PDF experience as painless as possible! Please refer to page 3 of the instructions for details on what you need to print. I really hope you enjoy making this and would love to see your versions if you do. Until Monday, have fun and happy stitching! WAHOOO!!!!!!!!!! i just scored the perfect fabric for this! downloading right this very minute. thank you, lovely lady! Yay!!! I hope you like it! It will look fab on you!!!! I can't wait to see! Merci beaucoup pour ce cadeau, je ferais la photo. Thank-you Ai, I hope you like it! all those pictures are really brilliant and the long sleeves are so fitted here, with that feminine attitude and really interesting style! just awesome all the black party dresses with long sleeves for prom or cocktail party, every girl must have at least 3-4 black dresses in the wardrobe! Hi Lara thanks so much for your comment! I'm happy you like it and would love to see your version! Hi Katy thank you so much for your nice comment! Best of luck with your pattern drafting adventure! I'm looking forward to following along and hope I can share any tips along the way! I was so excited when you said you were releasing this pattern! I love your three versions of this dress. Just beautiful! Thank you so much Eryn! Thank you for making this pattern available! So generous. After seeing the beautiful versions you have made, I can't wait to have a go. Thank you for your nice comment and enjoy! I hope you have fun making it! Would love to see your version! Hi Jen, of course not! Thanks so much I'd love that! Thank you for your nice comment, I hope your readers like it too! Oh lovely! how sweet of you! This is beautiful! Thanks for the free pattern. I plan to download and send to my sister so she can make one for me. Thanks for the comment! Good plan! :) hope to see it! I'm printing it tomorrow at work when my boss is out of office. Oooh, what a lovely dress. Can't wait to download it and give it a try! Thank you, happy you like it! Have fun! Thanks! It's beautiful. I hope to work on making a dress for myself this summer. You're welcome! Have fun! Hope I get to see a pic too! How fun! I've got a couple of other projects to finish over the next few weeks, but I'm excited to see what everyone makes with this pattern! Cute dress! Thank you so much for sharing the pattern and then offering help with the sleeves & waist line! Hi Jenny, thank you! I hope you find it useful! Thanks so much, I'm happy you like it! I'd love to see it when you're finished! i can't download it! am i the only one having this problem? maybe its my computer, but it tells me there are too many "redirects" :( is there any other way i can get this pattern and the instructions? I'm happy you like it and I hope you get to make it. If you keep having problems let me know! im loving this pattern! i have the perfect fabric for it too. do you think that this pattern would be too difficult for a beginner sewer? i have never made a dress before but i really want to try. i have read over the instructions that you have added with the pattern but to be honest i don't understand them very well, i guess im not very well aquatinted with all the sewing terms. any suggestions before i start? Hi Celeste! It's suitable for a beginner but if you've never sewn anything before I can see why the instructions sound confusing. Why not try making a muslin first? Even using an old bed sheet? You wouldn't have to worry so much about mistakes and it would be a fun way to start. And you wouldn't have to worry about ruining that perfect fabric! Email me with any questions and I ill try to help out. Also happy to do a sew along if there's enough interest. Thanks for your comment! Thank you for sharing this pattern! I adore the grey versions you made, and I hope to make a version half as nice! Hi Tiffany, thanks o much! Happy to share, enjoy! Thanks for sharing this pattern! Your grey versions are especially lovely, and I hope to make one half as nice! Thank you so much for sharing this pattern! I can't wait to try it! Just one question - I'm in the US and this pattern says UK sizes. How do the two compare? I've never made anything that had only UK sizing. Hi crafty soprano! Thank you for your comment! The size 10 is equivalent to about a 6, but don't go by the sizes, use your bust and waist measurements to match the measurements in the chart and go from there. Have fun with it and let me know if you have any other questions! Thank you for sharing! I've had some blue tule overlay w/ designs on it that I've been looking for a good pattern to use with. This looks perfect! That sounds BEAUTIFUL! I hope you'll share a pic when you're done! Thanks for your comment! This is just adorable. Is your pattern sized in US or UK? I'm just wondering what the measurements are for your size 16. (bigger girls have to look out for this sort of thing!) I have the perfect pink suiting for this! Hi Joni! Pink suiting sounds SOO amazing! This is Uk sizing, but rather than go by the numbers check the bust and waist measurements in the instructions and match with your own. Unfortunately I had to cap my investment in this pattern so I could only choose 5 sizes. I really hope it works for you and I hope you'll share a photo if you do make it! I'm dying to see it in pink! Thanks for your comment! Is there a trick that I'm not getting? Hello, have you tried clearing your cookies? Let me know if this doesn't help. Hi Leah! Thank you! Loving your blog and looking forward to following! Fabulous!!! Can't wait, have fun! Yay can't wait to see!!!!! Going to try and do this one, this will be the first time I try a project with you. I think I will enjoy it, I am sitting in a hospital for long periods of time, need something I can do with my hands. This dress is so lovely, and I cant get it out of my mind! 2) can I use fabrics without stretch? Like wool flannel? Thank You so much for this lovely pattern! Hello! The fabric requirements are on page 1 of the instructions (in metres not yards so you will need slightly less one yard is 1.094 metres). Also it is not suitable for fabrics with stretch, wool flannel sound great! Before you cut the sleeves please check the tutorial I posted on how to customise them to your size. They are narrower than most! This looks wonderful! I cannot wait to try it :) Will be my next rainy-day project! Hi! There seems to be something wrong with the download. It's too bad, it seems like an awesome pattern! Hi Shona, have you tried clearing the cookies on your computer? Let me know if that doesn't help! OMG this is a great pattern, tx for sharing! Now that I've found your blog I won't let you go ;) I'm your GFC follower n° 100 YAY!!! Hi mama nene! Ha ha thanks for stopping by! I'm your 187 and looking forward to following! :) have fun with the pattern and don't forget to check out my tutorial on how to adjust the sleeves! Hi Elise, thank you so much for sharing this pattern! I like all three versions and I love the detail of the band to hide the hem: fantastic!!! I was looking for an inspiration and I've found it! Hope you like the pattern - please check my tutorial on how to make the sleeves too! I absolutely love this pattern!! The dress looks so cute!! I think I love the winter version the most, looks so perfect for a winter date. Looking forward to making this dress! Thank you Aeliana, enjoy! I hope to see a pic when you do! Please check the sleeves before you cut, as they are narrow. Hi there.can I pls know how to download the pattern.I fell in love with this dress as soon as I saw.hoping to make it in the mid year break. Hi Kiwi, Sorry to hear you can't get the pattern - can you let me know what kind of error message you're seeing? You might want to try clearing the cookies on your computer. Let me know if this doesn't work. Thanks for your message, I hope you get to make it! I'd be happy to! But I can't see your email address on your profile - can you please send me an email and I'll reply with the pattern? hello. I love your dress and want to sew one for me but I download it. The link sent me to my own Gdrive page and I did the cookie thing. Can you help me? Hi there, no problem! Drop me an email and I'll forward it to you. Today I could!!!! I have it, Thank you. Hi this is so cute and I just bought some designer fabric so I would love to make this my first dress project ever! I do have a question though. After I printed out the pattern and lay them all out. I taped and cut them out and I noticed that the front skirt band and the back skirt band pieces are slightly shorter than the front and back skirt piece. Is that by design? Or did I make a mistake when I taped up the pages? Which do you think is the easier version 1 or 2? I didn't see version 3. The Hem piece is also shorter than the skirt pieces too. Hi Janette, I've just sent you an email - let me know if tis helps! Great one, looking forward to sew it! Hi Miss T, apologies for the late reply I've been away. You could definitely substitute gathers, that would be really nice I think! As for the fabric, go ahead with taffeta but you may want to sew it a size larger to make sure you have enough room - it is a close fitting pattern so one thing with a bit of give works best. Have fun, I'd love to see a photo when you finish! I really love this pattern but have grown a bit to big for it. If I wanted to add 2 sizes How much more would I add to the sides? This pattern reminds me of some dresses I wore as a teen in the 60's. This would make even a large size girl feel pretty. Thank you so much for the free pattern. Hi Daisey thanks so much for the lovely comment! I'm delighted tat you want to sew my dress. Unfortunately grading is not my forte, I had a professional grader do the sizing for me. 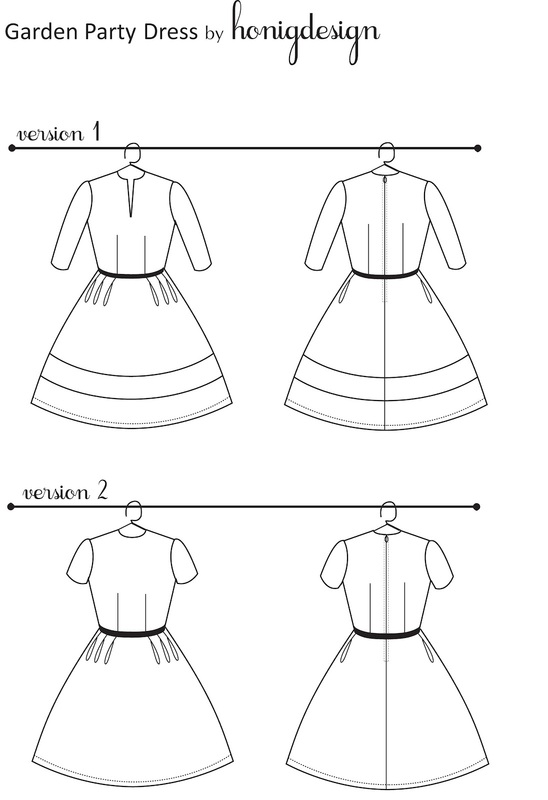 I just did a quick google search and found this Craftsy tutorial http://www.craftsy.com/article/pattern-grading I'm sure Burda and Threads magazine will have some guidance too. I hope this helps. I'd love to know how you get on! Good luck! je découvre ce patron, j'adore les 3 versions . merci beaucoup pour ce patron free . so nice to you to share this patern which is just lovely. thank you. Merci beaucoup pour ce patron que je vais tenter. Vos réalisations sont superbes! Désolée de ne pas écrire mon commentaire en anglais, mais je ne suis pas assez douée. Je suis très très intéressée par ce patron de robe magnifique, mais je ne peux pas y accéder en français... Ca bloque la page. Vous-est-il possible de m'envoyer le patron et les explications par mail? Hi Pénelopé, I'm sorry I can't speak French well enough to reply! Please drop me an email and Ill forward you the pattern and instructions. Thank you for your nice comment! Sorry not write my review in English, but I'm not talented enough. I am very interested in this gorgeous dress pattern, but I can not access it ... It blocks the French page. You-is it possible to send me the pattern and explanations by email? Hi Dave/Penelope, I'm happy to send it to you - can you please send me an email or give me an email address so I can forward it back to you? Hope to help! Printed te pattern... but never thought of looking at the measurements. My bust is 104 cm and hips 104 cm, but my waist is 88 cm.. so this dress will never fit me properly:'( and I already had the perfect fabric:( Thank you anyway for this lovely pattern maybe I can make a friend happy with it! Hello, I find your dress very nice and would like to try sewing it. I am in France and could not download the pattern. I will send you an email. Thanks in advance. I have just uploaded a copy of the pattern to google docs. Please give it a try, it should work now! Hello I am sorry to hear you are having trouble downloading. I've just uploaded a new doc, I hope it works for you now! oops, just saw this comment. would you please send me one too ? christellehabimana@hotmail.com thanks in advance ! Hi there, I have just uploaded a fresh version to google docs, can you give this one a try please? If not I will email it to you! hi there i have made this pattern many times with different kinds of fabric and each time i recieved lots of compliments although im a beginner in sewing. thank you a lot fir this awesome pattern and thanks for sharing it free. Hi Gonca, Thank you so much for your comment! I'm soo happy to hear that you're making the pattern, I only wish I could have a peek but understand if you want to remain anonymous on the net! Congratulations on your happy news! I haven't had to think about pregnancy adjustments myself yet so have to admit at first thought I'm not sure how I'd approach it... because the dress has a pretty high waist already I might play with shortening the bodice one or two inches further and lengthening the skirt? But I would practice on an old bedsheet first! Wishing you a happy and healthy pregnancy and happy sewing! I have been looking for a basic pattern of this style. Corticosteroids have my upper half much larger than the lower half, and want to attempt to camouflage this upside-down pear shape. Hi Pamela and thank you for your note! I really hope this dress gives you what you are looking for! I must warn you that there is not a lot of ease in the bodice so you will probably want to do a FBA or maybe consider pairing the skirt with a top pattern you have that fits you well? I empathise with you having done a heavy dose of steroids myself in my 20s and I know it is not fun. If you have any questions about the pattern along the way please don't hesitate to drop me an email! Beautiful pattern. I have downloaded it. I had trouble getting it to print so that the test square is 10 cm, but printing it at 106% worked :). I'd like to check - does the 10cm for the test square include the width of the the black line or should the inside white square be 10 cm wide? I'm looking forward to making this beautiful dress. Thank you. Hi Karen! Best bet is to the centre, does that work? I would say err on the side of making the pattern bigger and you can take in as needed as you fit. Would love to see your version when you finish! Trying out this pattern today! Can't wait to see how it turns out! Great! I hope you like it! Would love to see a pic of your version if you're willing to share! You think it's possible to sew this dress in heavy knit fabric, so without the zipper then? Hmm. It's hard to say. It's not technically designed for knit fabric, and I haven't tested it on knit fabric so I would say proceed with caution... It also depends on how much stretch is in the knit. I'd love to know how it works out if you do try it! So generous of you to share this gorgeous pattern and so lovely of you to give these nice replies to everyone! Cheers to you! My test square comes out to 9x9 cm everytime. Not sure what I'm doin wrong. Thank you so much for sharing this fantastic pattern! Hi, I just love the style of this dress; However, I was unable to download the pattern. can you please help me? Hi Shaindel, have you tried clearing the cookies on your computer? I'm told that can block it. Let me know if that doesn't work! Hello! I love this dress and would love to make one of my own but I don't have access to A4 paper. Is there a way to print the pattern on another size paper that would result in the same scale? Thanks for sharing such a great pattern!! Hi Courtney, would you be able to take it to a copy shop and have them print it out on larger paper, that is both longer and wider, and then you could cut around it? Although it's very important not to "scale" to the new size of paper! I love this & plan to make one with sleeves. Here the version I made with some light wool. Thanks so much for the great pattern! Wow...your dresses Awesome.Nice design.And looking son beautiful. I am getting ready to make the plain neck, short sleeve version of this in a lovely red cotton, and am planning to also add a flat collar of some kind. I do have some issues though. I have to increase the pattern to match my measurements. To make that easier, can I get the finished measurements also? I know there is some ease added, but I don't know how much, and really don't want to have to make a full mock up. Thanks. Hi there! There is about 5cm of ease added, but I would defiitely recommend making a quick mock up, especially before cutting into your lovely red cotton :) Any other questions along the way please feel free to send me an email: designhonig [at] gmail [dot] com. Have fun! Hi Madam Rosmerta! Sorry for the late reply! Wow Violet and Red sounds beautiful. To reduce the sleeve width, don't reduce the whole sleeve but start at point where the "shoulder cap" meets the sleeve length draw a line from "0" to 1.5cm in on each side (or whatever you want to reduce it by). So it's not a parallel line but a gradual line.... Does this help? Email me if you have any questions! I would love to see how it looks! I really like this one. I'm gonna make me a party-dress for Christmas... Thanks!! I came by this post through Pintrest and I so wanted to make this dress for myself. I had a look at the instructions though and they suggest that I am between a 14-16+ according to my measurements and Ii buy clothes at the shops that are 10 or 10-12. So still not sure if I want to go through all the hassle of printing and putting the pattern together when it might not fit me. How did you come by the measurements you based the pattern grading to? And did anybody else face the same dilemma as me (sorry, the comments list is mighty long and I have not read through it all)? Thanks. Thanks for getting in touch! I used a standard dressmaking block used here in the UK. Definitely do not go by the size you think you should be according to what you buy in a store, but look at the measurements themselves. This is true for any sewing patterns you use. I know it's a hassle but it's also a great idea to make a muslin first, especially if you don't want to risk ruining your special fabric ;) Best of luck and please do email if you have any other questions! je souhaiterai faire votre robe pour noel mais les instructions sont en anglais et je ne sais pas combien de tissu et accessoire j'ai besoin. Pouvez vous m'aider s'il vous plait. merci d'avance. Thank you too much for sharing such a beautiful blog info.. I was so exited for this post.. I really love your Pattern and design of dress ... I shall definitely use it .. Wonderful blog ... Keep posting..
Hi I am just about to start cutting the fabric however i am very confused about the skirt band. I don't understand why we have to trace a band onto piece K when we have piece G and H. What are those pieces for if not to use as a band? sorry i might be being very stupid. Your instructions do not include sewing the band on. Hello! I'm sorry I haven't been on my blog for a while, I hope you were able to work everything out!